If you’ve been reading LaaLoosh for a while, you’ll probably know that roasting vegetables is one of my favorite ways to eat them. The roasting process adds such a fantastic flavor, and even my kids will eat their veggies this way, so that’s a huge plus. One of our family’s favorite vegetables to roast is cauliflower, so recently, I decided to experiment with a few ideas and see if I could take a standard, roasted cauliflower recipe, and kick it up a notch. Mission accomplished. This Roasted Cumin Spiced Cauliflower and Garbanzo Beans is so ridiculously simple, but is absolutely delicious and truly tastes like something that would be served as a side dish in a fancy restaurant. You can enjoy it is as is, or serve on top of salads or in soups for added flavor bonus. I like to serve it in a pretty bowl, garnished with fresh parsley, alongside my protein of choice. If you are looking for a way to get more fiber in your diet, this easy Weight Watchers side dish recipe is a must. 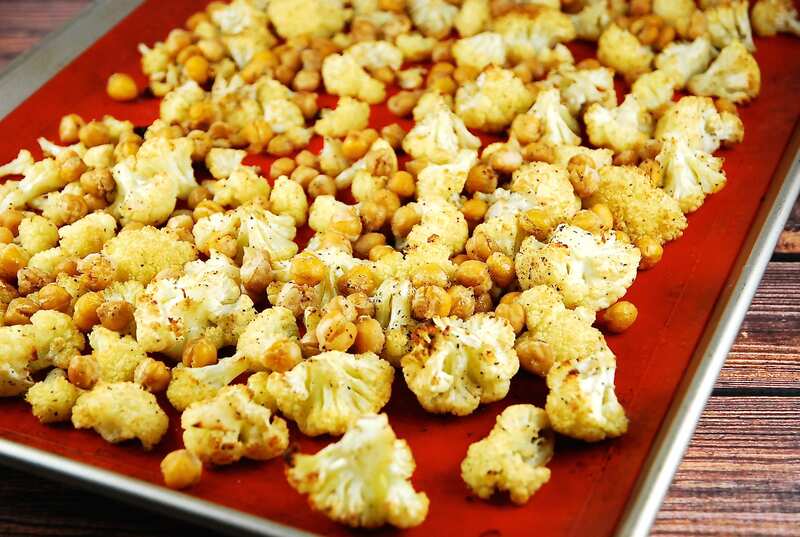 Incredibly flavored cauliflower and garbanzo beans are roasted to golden perfection in this easy Weight Watchers side dish recipe. Packed with protein, fiber and nutrition, this dish offers a great way to make vegetables taste decadent! Preheat oven to 400, and line a large, rimmed baking sheet with parchment paper. Lightly mist with cooking spray or an olive oil mister. Place all ingredients in a large Ziplock bag, seal, and shake well to evenly coat. Dump contents onto baking sheet, and spread out evenly. Place in oven and roast for about 20 minutes, shaking the baking sheet once or twice throughout, to help ensure even roasting. I love this recipe and have made it a few times. It tastes great on a salad after being chilled in the refrigerator. I just ran the ingredients through the WW recipe builder, and it comes to 4 PP per serving (for 6 servings). Why do you list this as 3 PP? The WW Recipe Builder doesn’t always calculate based on exact brands. They typically use an average for each ingredient. I calculate the Points Plus based on the labels off of the exact ingredients I use. In this case, I probably used a brand of garbanzo beans that were less in Points Plus that the Weight Watchers Recipe Builder’s average. This looks amazing! Planning to make it tomorrow, BUT I don’t know why you do not have you site set up to allow me to Pin this on my Pintrest page, I like to go there to get my recipes and reuse them!